Can you picture a child who has fallen through the cracks? Who is that kid on the margins that requires the most patience? You know-that student who makes your job ten-times harder, but it’s impossible to stay mad because you know what darkness awaits him at home? Though we don’t quite know how to address it, there are kids like this in every church and I call them Bluebonnet Children. This is their book, and if you have a heart for kids, I wrote this book for you. The renowned Bluebonnet flower grows in poor soil. One would never guess this to be true, but the bright, proud bonnet tells no lies. Not even unkempt soil can keep a Bluebonnet from producing its lovely blossoms. People can be similar to the Bluebonnet flower. They too can be born into poor soil with environmental and contextual challenges. Kids from neglectful or abusive families are called Bluebonnet Children. We are trained in Children’s and Family Ministry that the parent is the primary faith nurturer. But what happens to a child who does not have a healthy parent to nourish their needs? While it is tempting to leave such work up to the professionals of the courtroom and counseling sessions, the faith community can also play a formative role and act as a supplemental family. This book offers helpful tools and inspiring stories to assist Children’s Ministry leaders (staff or volunteers) in this endeavor and to catalyze an entire congregation towards action. 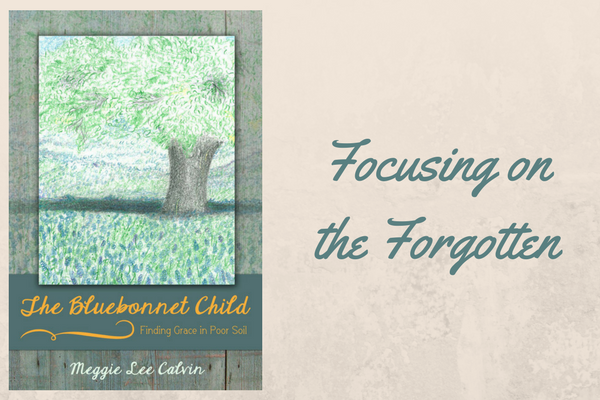 The tale of the Bluebonnet Child is heavy, but in Christ there is hope. The Bluebonnet Child is a ministry resource that guides readers to adopt the Triple-A Approach. With this approach, they can become more aware of the child’s story, advocate for her needs, and theologically articulate how the healing power of Christ is at work in her life. Each chapter is full of concrete examples and educational tactics that are immediately applicable in one’s ministry setting. This is an intentionally short work (twenty-four-thousand words) for the busy practitioner. The Bluebonnet Child brings a unique voice to the conversation on healing through trauma because it is written from a theological perspective, as opposed to an autobiographical (as Rosie Revera’s My Broken Pieces), or psychological/ legal one (as Lisa Fonte’s Child Abuse and Culture). Its foundation is James 1:27 which calls the Body of Christ to care for the orphan, the loveless and the fatherless. Unlike similar reads, this book seeks to improve the systemic issues latent within Children’s Ministry programs. My experience in working closely with the Kansas Leadership Center in my county, as well as my experiences developing healthy volunteer teams – the bedrock of a Children’s Ministry system – have informed the writing of this book. Regardless of a reader’s prior knowledge of theology, psychology, or educational theory, this book will hold his hand and lead him into the light of this dark work. As an adoptive mother and one who works in foster care and adoption, I am very interested in reading this. Thanks for caring for kids from hard places.